I was feeling a bit glum about not having much in the way of craftiness to show you at the moment, when it occurred to me...I have a stack of quilts about the house (and folded in cupboards, piled in boxes) that I haven't ever shared - and maybe you'd like to see a few of them? 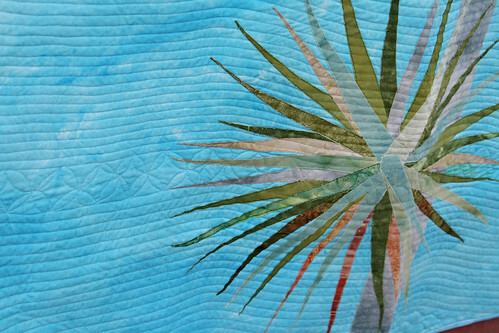 So, when the amazing kiwi textile artiste Clare Smith offered a 2 day class on spiky tree quilts (way back in 2003, eek!) I was definitely in! 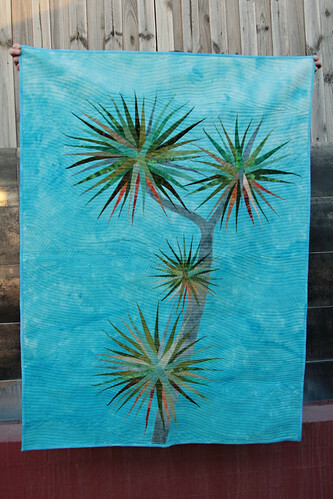 This is the only quilt I've ever made that's along the lines of and *art* or *pictoral* quilt. I managed to get the whole top pieced during the class, including a couple of restarts like handpainting the background fabric in its entirety at the beginning of day 2! Within a week of the class, I had the quilt basted and probably 1/3 quilted. And then life intervened, as did other quilts, and on and on. This quilt ended up in a box of UFOs and WIPs that went to the Cook Islands, and to Seychelles, and back to NZ again, without a single stitch being added. 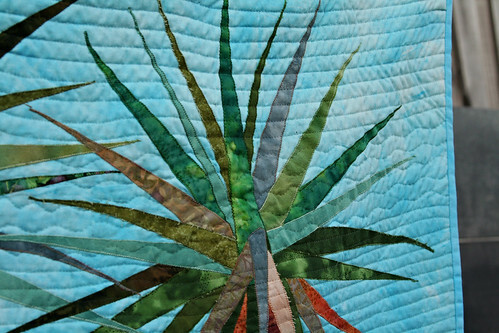 Last year, I finally gave myself the proverbial kick in the pants and finished off the quilting. Good grief was that pound of flesh! 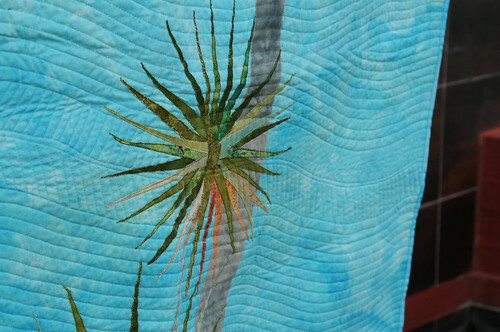 (but I do love the movement it gives to the quilt) And then of course I had to let the whole thing sit and germinate for a bit before I finally adding the binding and hand stitched it down in the new year. I love how it turned out, even if my cabbage tree leaf clusters are more asterisk than foliage. Oh, and the quilt is flat, but the utter morons moving people unrolled all my finished quilts and squished them into boxes. (No folding required!!!! apparently. grr) and I'd only just located and liberated them the night before. And now it's finally done, who knows - it may even get hung in this house. as the Mainland cheese guys maintain, these things take time! Christchurch's latest earthquake is an exception. Yesterday's quake occurred just before 1pm and was devastating in its delivery and impact. So far 75 people have been confirmed dead, and just over 300 are still on the missing list - most of those presumed trapped in fallen buildings and debris. 80% of Christchurch remains without water, and about 50% without power. It's a bit hard to know quite what to do to help from here (we are in the upper middle of the North Island, so far from the central South Island where Christchurch is located) but the thinking cap is on.